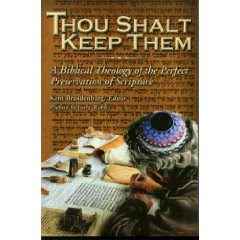 "Thou Shalt Keep Them: A Biblical Theology of the Perfect Preservation of Scripture" Edited by Pastor Kent Brandenburg, and published by Pillar and Ground Publishing, 4905 Appian Way, El Sobrante, California. This book is a Biblical theology of the doctrine of the Preservation of Scripture. The issue of the English Bible controversy is usually discussed with a mere handful of Bible verses and a lot more "scholastic" input from men. This book soundly delineates Scriptural reasons for holding to the Masoretic (O.T.) and Received (N.T.) text representing the King James Version from a perspective of faith. It is a true gem of a book because each writer exposits actual Bible verses that bear upon the God's promise to preserve His words. Another strength is that this book is essentially the work of a group of pastors or men who have served or is serving as pastoral staff. While many in the world today look to scholars (especially Bible critics) for answers, God's man is neglected or religated to the Sunday service as a mere homiletical cheerleader. But these men are not so, they truly are powerful theological heralds of the gospel. They love the Lord, His word and His people. They challenge "would be fundamentalists," established Bible critics, conservative Evangelicals, and even neo-Orthodox teachers to examine what the Bible actually says about it's own inspiration, preservation, and canonization. This book is one of the finest books in defense of the KJV/TR/MT position, while avoiding the errors of Ruckman and Riplinger. 315 pages of good stuff, soft cover, (c) 2003.